Vendor Portal is a web-based solution that provides permission-based access to vendors for real-time information about their purchase orders, shipment statuses, open invoices, payment history, inventory supply, and more from any device (iPhone, iPad, Android, and more). Complete the form to test drive Vendor Portal. Get a hands-on look at what your vendors would see. 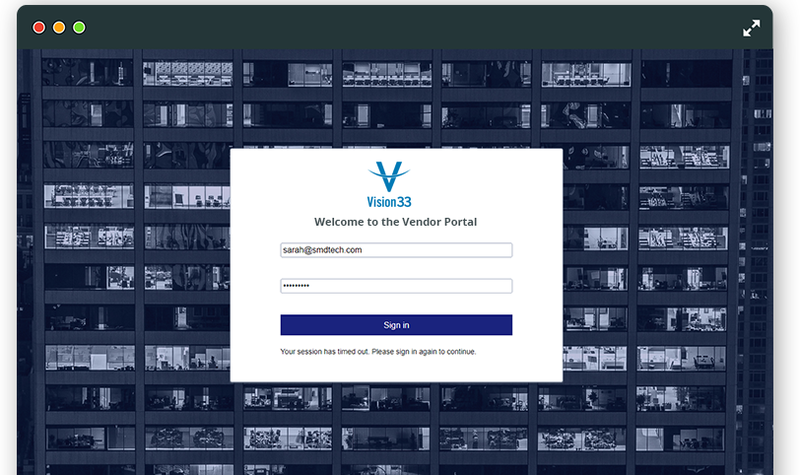 Use the login information provided on the screen and get instant access to experience the power of Vendor Portal first-hand. Check on item statuses, view A/P invoices, open purchase orders, and view overdue shipments. See how this powerful solution can help answer your vendors' everyday questions as you explore the test version of Vendor Portal. Empower your Vendors with Secure Access to Company Data. Contact us if you have any additional questions about Vendor Portal or if you would like a representative from Vision33 to walk through the test drive with you.